I’ve got a cool story for you about the power of sharing feedback — both positive and negative. A while back, I wrote a letter to the president of my credit union (let’s call her Sarah). I wanted to let her know about a teller who was consistently cold and impersonal. Whether she was waiting on me or another member, she would have this sullen, “I hate my job” expression. I never saw her looking friendly or happy. Ever. I gave Sarah, the president, this feedback because I really like her and know she cares about customer service and would want to know. If I thought Sarah wouldn’t do anything with the feedback, I wouldn’t have bothered to give it (There’s a big lesson right there, customer service professionals). She said she would share my letter. She also offered a bit of this young woman’s back story, the hard childhood she had and the challenges she was now facing. Sarah also shared how she could see the goodness in this young woman and had taken her under her wing. Sarah later emailed me to say that she had shared my letter with all the tellers and noted that the teller in question looked very concerned, even mortified. Fast forward a few months. I’m preparing for two different programs on customer service, so I have “customer service on my mind” even more than usual. I stopped at the credit union and this young woman waited on me. She was unbelievable. It was like dealing with a totally different person. There was none of the sullenness, social awkwardness or negativity she had previously radiated. She smiled and she spoke with a warm friendly tone of voice. She asked me how I was doing and said something about what a beautiful day it is. Now you might be thinking “That’s just good Customer Service 101,” and you would be right. However, it was 180 degrees from how she had been before, so it was striking. When I left I thought, “I want to make sure I recognize the great job she did, and not take it for granted.” So later that day, I wrote the president an email sharing my experience. Wow…I’m blown away with happiness! Tiffany really has exploded with personality plus ever since I read your letter to our staff. I know you said you can’t just learn warmth, caring, et cetera, and I agree; however, I always felt she had those qualities but was too shy to shine. By reading your letter and not “pointing the finger” I didn’t know what to expect. The very next day, a new Tiffany came to work and has consistently shown up ever since. She is bubbly, warm, caring and just plain lovable. When I questioned supervisors as to their perception as to Tiffany in the days that followed they all agreed she had gone from a bud to a full-blown rose. Wonderful!!!! Take the time to let people know when they rock. Just like you, my plate is uber-full and I easily could have said, “I don’t have time to write Sarah an email telling her how wonderful Tiffany was.” But then, I would not be doing my part in making the world a better place. Also, because “what gets recognized gets repeated,” when we take the time to acknowledge awesomeness, we get more awesomeness! So to apply this to your life — who is doing a rockin’ job at your work? How about letting them know? When we spread goodwill we feel better. I can’t tell you how great I felt knowing that my simple email was going to make Sarah happy and Tiffany even more so. As I write this, I’m smiling because I can imagine how good Tiffany will feel knowing that the changes she’s made were noticed and appreciated. When we do “random acts of kindness and generosity” we experience a release of feel good biochemical (like oxytocin and endorphins) that create what’s called the Helper’s High. Because of this, intentionally engaging in acts of kindness and generosity are among the most powerful ways to keep your spirits up. It’s also a great way to boost employee morale. 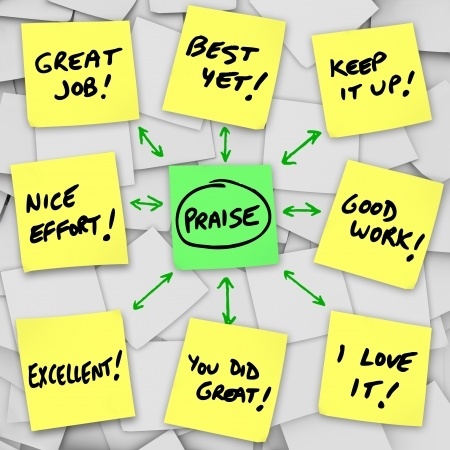 The more employees are encouraged to look for ways of being helpful to others, give compliments, show appreciation, and do other acts of goodwill, the better everyone in your organization feels. So, how about looking for opportunities today to give someone a sincere compliment, express appreciation, or spread goodwill in some other way? David Lee is the founder and principal of HumanNature@work and the creator of Stories That Change. He's an internationally recognized authority on organizational and managerial practices that optimize employee performance, morale, and engagement. He is also the author of "Managing Employee Stress and Safety," as well over 100 articles and book chapters. You can download more of his articles at HumanNature@work, contact him at david@humannatureatwork.com, or follow him on Twitter at http://twitter.com/humannaturework.